For many of us adults, the thought of losing our hair is terrifying. Unimaginable, even. Most of us would resort to hair implants, wigs, or microblading. Maybe even all three. But what one nine-year-old child can teach us is that there should be no shame in hair loss. In fact, it’s an opportunity to educate the world. 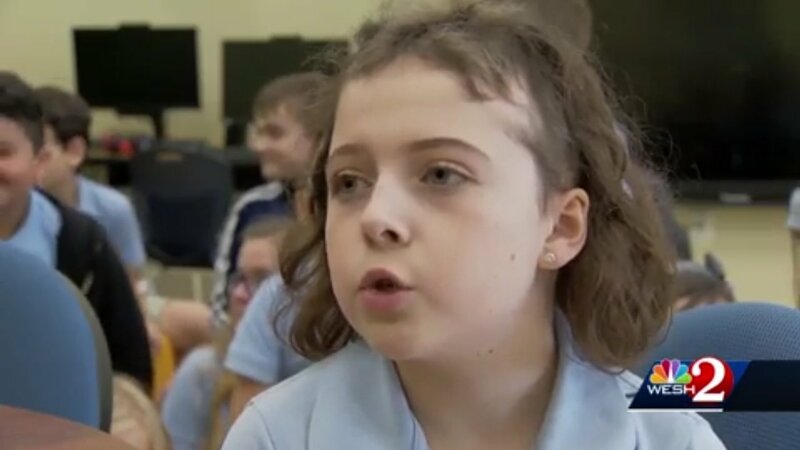 For nine-year-old Jenna Gathercole, neither her chronic hair loss nor the subsequent bullying she experienced dampened her spirit. The fourth grader spoke out at her school in Viera, Florida on February 5 and explained the disease to her classmates. “Hi, my name is Jenna, and I have something to share with you. This is my story of alopecia,” began her speech at Viera Charter School. Alopecia (also known as spot baldness) is a rare disease, and one that has no known cure. It’s also possible to lose either small or large amounts of hair, as well as only on the head (alopecia areata) or on the entire body (alopecia areata universalis). Not understanding her situation, Jenna’s classmates used to make fun of her hair. One of them even called her a boy, she said. As a result, Jenna decided to give them a glimpse of what she and other people living with alopecia go through. Armed with a PowerPoint presentation she made herself, Jenna bravely led the school assembly with her speech. “I want them to know I’m still me. I’m okay, and [just] because this is happening to me or anyone else, it’s not okay to bully,” Jenna said of her decision to explain her condition. She said that the most frequent questions she hears are what causes alopecia, what the cure is, and whether or not it’s contagious. Others ask her if she will one day go completely bald. Jenna said that she might and that she’s not yet sure if she will wear a wig. After her speech, Jenna’s classmates pledged to be kind, reports Florida Today. They also pledged to not bully others and to intervene if they see any instance of bullying. Jenna pays her doctor and dermatologist a visit every three months. She also uses a combination of creams, oils, and steroids to try and grow her hair back. Jenna’s parents are very supportive and actually encouraged her to share her story. “I am so incredibly proud of her,” mother Karen Gathercole told WESH. Brave acts like Jenna’s go a long way in educating people about alopecia. And the good news is she’s not alone. Just this month, a group of third graders shaved their heads in support of a classmate living with alopecia. Luke Nelson, 8, of Edmond, Oklahoma, started losing his hair in fall of 2018. It started with a patch of his eyebrow but soon spread to the side of his head. “By Christmas, he had completely lost all his hair,” mom Susan Nelson told PEOPLE. Luke’s little brother Sam, 7, decided to have his head shaved after Luke had to shave his. Their dad followed suit, as well. After Christmas break, Luke’s classmates at Oklahoma Christian School began looking for a way to cheer him up. On Jan. 19, fourteen boys and their parents flocked to Sports Clips Haircuts in Edmond. The fourteen boys got their heads shaved. It was a “really fun hair-shaving celebration,” described Susan. “As soon as the haircuts started, Luke ripped off his hat, and he has walked around with this confidence and this swagger,” she shared. For kids living with alopecia, what matters is letting them feel confident and loved. Whether they decide to embrace their bald, bold new look or opt for a wig, what matters is they have support. Alopecia is a lifelong condition. Hopefully, science can find a cure for alopecia when the kids grow up. But, either way, people with alopecia should feel like they can look however they want to look—free of judgment and with the support of their family and friends. Looking to tone down the baldness? Adults, with or without alopecia, can look into Organic Permanent Makeup’s organic scalp microblading. To learn more, click here. You can also drop us a line online or call us at 310-207-7797.